Buff earthenware with hand painted decoration. Mr Herman Hart was the manager of a series of international exhibitions. During his travels around Europe, and especially the Balkan States he collected examples of local, contemporary pottery; usually simple objects for daily use. He donated this collection to the South Kensington Museum in 1917, this acquisition record now provides us with information about the provenance of these pots, which are otherwise extremely difficult to attribute. Water jug, globular body, green lead glazed narrow neck with perforated opening and loop handle with green glazed orifice. The body and neck are unglazed and painted in red slip with horizontal zigzags and foliage. 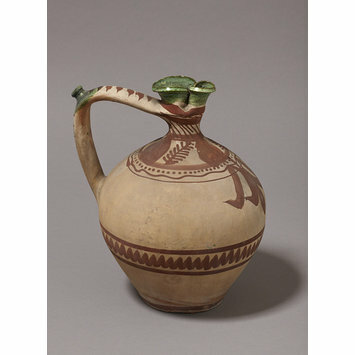 Mr Herman Hart, the donor, attributed this water jug to Bulgaria in his accompanying acquisition notes. Mr Hart was manager of a series of International Exhibitions and acquired pottery on his travels to Europe, including all the Balkan States. 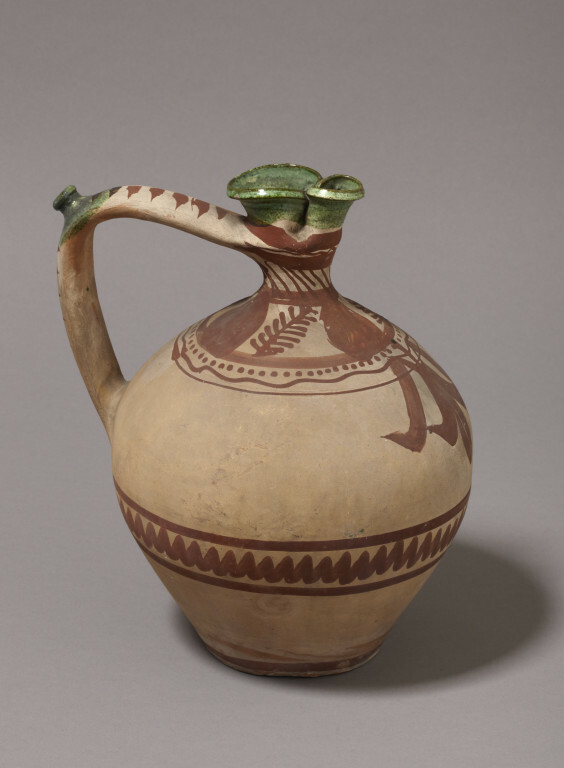 Jug of buff earthenware decorated with red slip and some green glaze. Bulgarian, late 19th or early 20th century.